December | 2017 | Mothers Against Wind Turbines Inc. I am concerned about the proposed wind turbines in Lake Erie. The foreign company that wants to do this is intends to make money off our natural wind patterns by selling electricity to CPP. They do not care about the impact that this project has on us, or the local ecosystem. They just want profits. 1. Placing these unsightly turbines in the lake would have an impact on fish. They could disrupt natural areas that support perch, steelhead, and walleye. 2. They could impact the migratory patterns of birds and local avian species such as bats and terns. They could have a negative effect on local birds like seagulls, barn swallows, and herons. 3. They have been banned in Canada. 4. They are ugly. Who wants to look at an awesome Lake Erie sunset with a wind turbine in it? 5. They create a huge navigational hazard to boaters. These turbines are proposed off a prime boating area NW of Cleveland. The 26,756 registered boaters of Cuyahoga county do not want to navigate around these obstructions during their relaxing day on the lake. This pending case appeals the building commissioner and the ZBA’s decision wherein both are claimed to have incorrectly interpreted the by-law to allow the issuance of a building permit (Mar 2010) for Wind 2. The Eilder group’s defense is grounded in a related action by the Court (Drummey v. Falmouth, 87 Mass. App. Ct. 127 (Feb 2015)), wherein Wind 1 required a special permit as part of a comprehensive bylaw scheme to control wind turbine placement and impact in the town. Drummey v. Falmouth was the definitive case forcing then Building Commissioner Eladio Gore to order the town to apply for a special permit for Wind 1. Building Commissioner Gore claimed Wind 2 was not addressed in Drummey v. Falmouth, and was thus exempt from his Wind 1 order. These accident statistics are copyright Caithness Windfarm Information Forum 2017. The data may be used or referred to by groups or individuals, provided that the source (Caithness Windfarm Information Forum) is acknowledged and our URL http://www.caithnesswindfarms.co.uk quoted at the same time. Caithness Windfarm Information Forum is not responsible for the accuracy of Third Party material or references. The attached detailed table includes all documented cases of wind turbine related accidents and incidents which could be found and confirmed through press reports or official information releases up to 30 September 2017. CWIF believe that this compendium of accident information may be the most comprehensive available anywhere. Data in the detailed table attached is by no means fully comprehensive – CWIF believe that what is attached may only be the “tip of the iceberg” in terms of numbers of accidents and their frequency. Indeed on 11 December 2011 the Daily Telegraph reported that RenewableUK confirmed that there had been 1500 wind turbine accidents and incidents in the UK alone in the previous 5 years. Data here reports only 142 UK accidents from 2006-2010 and so the figures here may only represent 9% of actual accidents. The data does however give an excellent cross-section of the types of accidents which can and do occur, and their consequences. With few exceptions, before about 1997 only data on fatal accidents has been found. The trend is as expected – as more turbines are built, more accidents occur. Numbers of recorded accidents reflect this, with an average of 22 accidents per year from 1997-2001 inclusive; 70 accidents per year from 2002-2006 inclusive; 135 accidents per year from 2007-11 inclusive, and 164 accidents per year from 2012-16 inclusive. Cost Benefit, Destruction from turbines, fighting big wind., Government Misrepresentation, Green Energy, Lack of municipal power in planning, Property Rights, Unite the Fight! Experience is something you get right after you need it. On the heels of a potent, jam-packed rally in Milford to implore the government to pack up its turbines and go home, the bitter aftertaste and lingering sting of feeling deceived and betrayed remains ours to mourn and avenge. When you think about it, the optics of investing in wind turbines can be construed as a patriotic opportunity to demonstrate support for green energy when better options may exist, but this turbine project is lead contender for first place as a blue ribbon colossal failure. Clearly, Premier Wynne doesn’t want to be confused with facts, she has already made up her mind. 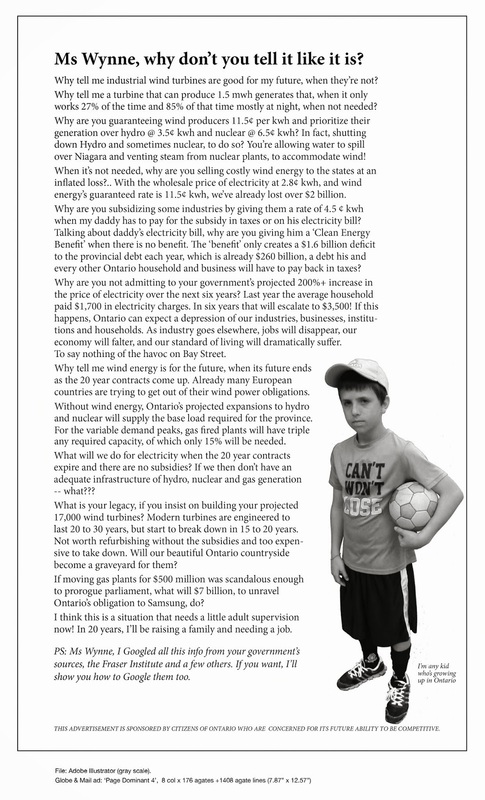 Wynne is at the helm of The Ontario Green Energy Act – the largest transfer of wealth in Canadian history, and as it crosses the performance finish line, it’s lagging behind, Wynne thinks it came in first. As recited in quote after quote: The net result is this is the most over- priced, inefficient, redundant, useless subsidized wind power electricity in North America, never mind Ontario. All supply with no demand. Ontarians have an abundant supply of apologies and Mea Culpa’s from the Ontario Energy Minister for “sub- optimal outcomes”. The notion of erecting seven 480’ turbines in Milford is just plain ludicrous, although the reality is easily heard by the heavy, gravel- laden trucks barreling down County Road 13 providing thunderous, early morning wake- up calls. The ugly esthetics beginning to sprout will impose a fire sale price tag for potential business investors in Milford and has struck fear in seniors inflicted with depressed residential land values while huddled beneath the looming white elephants. This is the Canadian government that has shoved its citizens to the sidelines to put up and shut up while they impose incompetent, environmental destruction upon a gentle community. The knights of South Marysburgh tilting at wind turbines are growing in numbers scattered across the belly of South Bay in a mission to quash the project. Appointing Milford for monolithic wind turbines flies in the face of all that is naturally beautiful, peaceful and harmonious in the County. The 800- miles of shoreline tucked into warm, white sand dunes, tropically- hued waters, wine, food, farming, olive oil, maple syrup and bursting with artistic bounty is sacrilegious. While defending both professional and personal scrutiny, perhaps Mayor Quaiff has the right idea, attacking the issue from within? After all, one of the most successful strategies every employed is “the enemy of my enemy is my friend”. Milford owns the mouth’s that roar “we are mad as hell and won’t take it anymore” and it has fallen on the selected hearing of Wynne. Steve Ferguson closed his speech at the APEC annual general meeting last Sunday, quoting McGuinty “they (the public) can’t stay mad at us forever”. In Milford, Ontario, those are fighting words.